Change the way you think about sales to sell more, and sell better. Over the past decade, Inbound Marketing has changed the way companies earn buyers’ trust and build their brands – through meaningful, helpful content. But with that change comes unprecedented access to information in a few quick keystrokes. Enter the age of the empowered buyer, one who no longer has to rely on a sales rep to research their challenges or learn more about how a company’s offering might fit their needs. Now, with more than 60% of purchasing decisions made in the absence of a sales rep, the role of the rep itself has been called into question. For front-line seller, sales manager, executives, and other sales professionals, Inbound Selling is the complete resource to help your business thrive in the age of the empowered buyer. 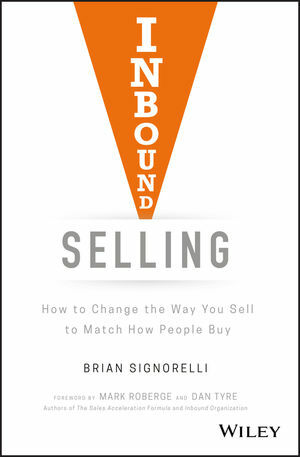 BRIAN SIGNORELLI is the director of HubSpot's Global Sales Partner Program, where he advises HubSpot partners on inbound sales and inbound marketing to grow their client's companies, as well as their own. He regularly writes, develops, and presents inbound sales content for HubSpot and its channel partners. He is also the founder of InboundSeller.com, where you can find tools and resources to become an inbound seller and transform any sales department into an inbound powerhouse.